Learn practical, field-tested strategies that will help you put the health back in healthcare! 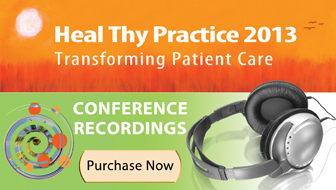 This course features lectures from the popular Heal Thy Practice-Transforming Patient Care 2012 conference held in Long Beach, CA. Offering equal measures of clinical skill-building, nuts & bolts practice development strategy, and inspiration from some of the pioneers and key opinion leaders in holistic/integrative medicine, Heal Thy Practice addresses some of the key challenges in building and sustaining a thriving holistic/integrative medical practice. 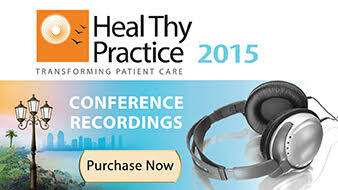 Whether you’re contemplating a major practice change or simply looking for practical advice for improving the fiscal health of your current practice and the physical health of your patients, you’ll find a wealth of valuable guidance in the sessions from Heal Thy Practice 2012. Our renowned faculty offers you their real world, field-tested experience and practical steps for creating and maintaining a healthy and health-focused integrative practice. 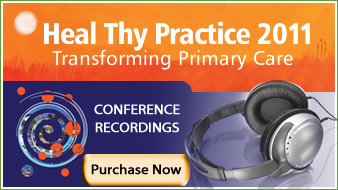 Heal Thy Practice, produced by Holistic Primary Care, is the nation’s leading conference dedicated to practice transformation & the implementation of integrative care. The 2012 program in Long Beach, CA offered equal measures of clinical skill-building, nuts & bolts practice development, and inspiration from some of the pioneers and key opinion leaders in holistic/integrative medicine.? Whether you’re contemplating a major change in your practice or simply looking for practical advice for improving the fiscal health of your current practice and the physical health of your patients, you’ll find a wealth of valuable guidance in the sessions from Heal Thy Practice 2012. Our renowned faculty offers you their real world, field-tested experience and practical steps for creating and maintaining a healthy and health-focused integrative practice. A board-certified family physician & former CEO of UCLA-Santa Monica Medical Center, Dr. Philippa Kennealy blends deep knowledge of clinical practice with strong administrative skill. Dr. Kennealy founded The Entrepreneurial MD, a consultancy in the Los Angeles area that helps physicians build thriving practices, reinvigorate their careers, overcome burnout & gain greater control over their lives. Founding Director, Scripps Center for Integrative Medicine, La Jolla, CA. Board certified in cardiology & nuclear medicine, as well as holistic medicine, Dr. Guarneri is at the forefront of the integrative & functional medicine movements. After a cardiology fellowship at New York University, Dr. Guarneri served as an interventional cardiologist at Scripps Clinic, where she later founded the widely regarded Center for Integratie Medicine. She is the author of numerous scientific papers, as well as the popular book, The Heart Speaks. Conference Chairman, Founder & Director, Masley Optimal Health Center, St. Petersburg, FL. Dr. Masley received his MD at the University of Washington, Seattle, and his specialty training in Family and Community Medicine at the University of Arizona, Tucson. He later became a certified nutritionist at the American College of Nutrition, and a certified acupuncturist with the International Acupuncture Institute in Hong Kong. He is the author of the popular Ten Years Younger books features on the Discovery Channel, the NBC Weekend Today Show, and hundreds of additional media interviews. A pioneering immunologist & neurobiologist, Dr. Aristo Vojdani received his PhD in Immunology & Microbiology from the Bar Ilan University, Israel. Since settling in the US, Dr. Vojdani has been at the forefront of research on the relationship between gut permeability, food & environmental allergens, and autoimmune disorders, which affect roughly 53 million Americans. He is currently the Chief Scientific Advisor for Cyrex Laboratories, a lab specializing in predictive autoantibody testing for autoimmune conditions. Dr. Gladd graduated from Indiana University School of Medicine in 2001, receiving training in family medicine at Ball Memorial Hospital in Muncie. He then went on to complete the University of Arizona’s Program in Integrative Medicine, which ultimately led to his founding a successful, direct-pay, holistic practice. He is also a medical advisor to HelloHealth, an innovative electronic health record platform that enables independent physicians to increase their revenue. Dr. May received her MD from the University of Arizona College of Medicine, and completed a three-year Family Medicine Residency at Good Samaritan Medical Center in Phoenix, Arizona where she served as Chief Resident. After 14 years of clinical family practice, she shifted her focus to helping people take charge of their health through mindful approaches to eating. Her “Am I Hungry?” mindful eating programs draw on her own personal experience with yo-yo dieting, as well as years of clinical work, offering patients a lively and life-changing approach that balances eating for enjoyment with eating for health. Combining 20 years’ of administrative experience as an executive at Microsoft, with an advanced degree in holistic nutrition and a lifelong interest in athletics, Miriam Zacharias is uniquely positioned to help health care practitioners optimize their practices through better time-management & more effective administration. Practice development consultant Tim Brolus takes a holistic approach to helping physicians improve the health of their practices, by focusing on three key “drivers” of success: Practice Development, Creating a “Wow” Experience for Patients, and Administrative Excellence. In today’s market, providing good clinical care is no guarantee of success. By concentrating on these “non-clinical” aspects of practice, doctors can end up greatly improving their ability to serve their patients. Founder/Director, Gottfried Center for Integrative Medicine, Berkeley, CA. Dr. Gottfried is a Harvard-educated integrative gynecologist in Berkeley, CA, with a special interest helping women cultivate health & vitality through a 3-step evidence-based method for natural hormone balancing. A yoga teacher as well as a practicing physician, Dr. Gottfried has been featured on the Rikki Lake Show, 20/20, and many other popular programs. She blogs frequently for the Huffington Post. Dr. Molly Roberts received her medical degree, and completed her Family Practice residency and internship at the University of Arizona. As a physician in Tucson, AZ, she co-founded her own healing center and worked as a holistic physician at the renowned Canyon Ranch spa. Dr. Roberts is a well-respected public speaker, workshop facilitator and radio host. She is the author of Blackwell Complementary and Alternative Medicine: Fast Facts for Medical Practice and The ION Handbook on nutritional testing. She is the current president of the American Holistic Medical Association. Integrative Physician Specialist, Institute for Health & Healing, California Pacific Medical Center, San Francisco. Dr. Bruce Roberts is board-certified in Family Practice and Psychiatry. He received his MD from Michigan State University, and completed both his Family Practice and Psychiatry residencies at the University of Arizona. He is also certified by the American Board of Integrative and Holistic Medicine, with additional certification through the Center for Mind Body Medicine. Bruce has worked in a variety of settings ranging from community mental health clinics to world class health resorts. Before relocating to San Francisco, he ran his own healing center in Tucson. Dr. Hans Vink completed his PhD at the University of Amsterdam, on the subject of Glycocalyx. From 1995 onwards, he developed a research program on the endothelial glycocalyx (www.glycocalyx.nl). In 2006 he was awarded an Established Investigatorship by the Netherlands Heart Foundation. He is Principal Investigator at the Cardiovascular Research Institute of Maastricht and was appointed professor of Circulatory Physics at the University in Amsterdam in 2008. His research on the endothelial glycocalyx is supported by program grants from the Center for Translational Molecular Medicine, The Netherlands Heart Foundation, The Dutch Diabetes Research Foundation and the Netherlands Kidney Foundation. He has published more than 40 scientific publications and supervised 9 PhDs (Hirsh factor 20). Dr. Vink is founder of GlycoCheck BV and is the Chief Scientific Advisor to Vascular Health Sciences. Alan Dumoff, JD, MSW has practiced law since 1988, with a special focus on the legal needs of integrative physicians and complementary and alternative (CAM) practitioners. A former acting director of the National Commission for the Certification of Acupuncturists, Mr. Dumoff assists physicians and CAM practitioners with a wide range of regulatory, insurance, and disciplinary issues, including billing and reimbursement matters, practice structure, dietary supplement and medical device regulation, laboratory requirements and medical/health board disciplinary charges. A lifelong interest in holistic medicine, combined with a degree in Economics from the University of Nottingham, led James Maskell to found Revive NYC, a practice development consultancy dedicated to helping holistic clinicians succeed. A leader in the field of functional medicine, Dr. Hays received her MD and completed a residency in Ob/Gyn at Baylor College of Medicine, Houston. Over a career lasting more than 32 years, Dr. Hays has practiced Ob/Gyn and functional medicine in a range of clinical settings. Her True North clinic in Falmouth, ME, now celebrating its 10th year, is widely recognized as a model of integrative, community-based care. A licensed Naturopathic Doctor, Dr. Chasse is the medical director at the Northeast Center for Holistic Medicine, Bedford, NH. Dr. Chasse is a graduate of Bastyr University in Seattle, Washington, the world’s leading university in the natural health sciences. She currently serves as the president of the New Hampshire Association of Naturopathic Doctors, and as a medical educator for Emerson Ecologics. Mr. Shoffner, a graduate of North Carolina State University, has over 18 years’ experience in sales and entrepreneurial leadership, with experience in employee benefits, health plan design and disease management. Under his leadership, Physician Care Direct’s Practice Development team is recruiting talented physicians to offer direct pay healthcare while educating employers on the value of direct pay to reduce healthcare costs and improve the quality of primary care. conditions & other common disorders. • Improve care of “difficult” patients with complex disorders. service; concierge care, functional medicine. well as traditional marketing strategies for practice-building. • Apply practical entrepreneurial & management skills. • Renew enthusiasm for clinical practice. The Heal Thy Practice 2012 lectures are intended for medical doctors (MDs), doctors of osteopathy (DOs), broad-scope chiropractors (DCs), naturopathic physicians (NDs/NMDs), advanced practice nurses, nutrition counselors, medical students, and other health care professionals interested in improving clinical outcomes, as well as the business aspects of their practices through prevention-focused, patient-centered medicine. A board-certified family physician & former CEO of UCLA-Santa Monica Medical Center, Dr. Philippa Kennealy blends deep knowledge of clinical practice with strong administrative skill, Dr. Kennealy founded The Entrepreneurial MD, a consultancy that helps physicians build thriving practices, reinvigorate their careers, overcome burnout & gain greater control over their lives. In this talk, she explains how an entrepreneurial approach can re-introduce you to your own creativity & resourcefulness, and suggests pathways for building your dream practice. Board certified in cardiology & nuclear medicine, as well as holistic medicine, Dr. Guarneri is at the forefront of the integrative & functional medicine movements. After a cardiology fellowship at New York University, Dr. Guarneri served as an interventional cardiologist at Scripps Clinic, where she witnessed the miracles and limitations of high-tech care. As founding director of the Scripps Center for Integrative Medicine, she has learned much about what it takes to create & sustain an economically viable integrative clinic. In this session, she shares valuable “lessons learned” in the development and ongoing management of an integrative clinic. Preventing heart disease requires a comprehensive approach centered on healthful eating, exercise & stress management. Drawing on his acclaimed “Cutting Edge Nutrition” talks & highly successful “Ten Years Younger” protocols, Dr. Masley details how to engage patients in lifestyle changes, and share practical advice on how to successfully implement nutrition-based programs in your clinic. The vast majority of primary care doctors refer patients out to specialists for stress testing & CVD risk evaluation. In doing so, they’re giving away an opportunity to create a robust revenue stream and to engage more deeply with their at-risk patients. Dr. Evans, a pioneer in office-based exercise testing outlines the science of stress testing as well as practical strategies for integrating it into primary care practice. Pioneering immunologist Aristo Vojdani returns to Heal Thy Practice & describes the relationship between gut permeability, food & environmental allergens, and autoimmune disorders, which affect roughly 53 million Americans. Advances in predictive antibody testing can enable clinicians to detect many autoimmune diseases years before they become debilitating and when they are most responsive to lifestyle-based interventions. Dr. Vojdani outlines the transformative potential of these new tests (Sponsored by Cyrex Laboratories). Board-certified in family medicine, Dr. Gladd’s need to deal with his own health challenges led him to the University of Arizona’s Program in Integrative Medicine, and ultimately to his founding a successful, direct-pay, holistic practice in small-town Indiana. In this session, Dr. Gladd, a Heal Thy Practice 2009 alum, shares the practice-building tips he learned in creating his clinic. A board-certified family physician from Phoenix, AZ, Dr. May has helped thousands of patients make transformative lifestyle changes with her “Am I Hungry?” mindful eating programs. Drawing on her own personal experience with yo-yo dieting, as well as years of clinical work, Dr. May offers a lively and life-changing approach that balances eating for enjoyment with eating for health. Combining 20 years’ of administrative experience as an executive at Microsoft, with an advanced degree in holistic nutrition and a lifelong interest in athletics, Miriam Zacharias is uniquely positioned to help health care practitioners optimize their practices through better time-management & more effective administration. In the course of this talk, Miriam challenges many common myths and misunderstandings about time management, and offers practical, field-tested tips for improving the use of time, energy and attention. Practice development consultant Tim Brolus takes a holistic approach to helping physicians improve the health of their practices, by focusing on three key “drivers” of success: Practice Development, Creating a “Wow” Experience for Patients, and Administrative Excellence. In today’s market, providing good clinical care is no guarantee of success. By concentrating on these “non-clinical” aspects of practice, doctors can end up greatly improving their ability to serve their patients. On the way, they often find their own satisfaction increasing. Sara Gottfried, MD, is a Harvard-educated integrative gynecologist in Berkeley, CA. Several years ago, she was like many clinicians: over-stressed, overworked, and barely making ends meet. In stepping outside the constraints of insurance-based medicine, she’s been able to create a thriving direct-pay practice focused on helping women cultivate health & vitality through a 3-step evidence-based method for natural hormone balancing. In this talk, Dr. Gottfried shares the basics of her protocol, her practice model, and valuable tips for sustaining an independent non-insurance practice. Dr. Molly Roberts, current president of the American Holistic Medical Association, and her husband Dr. Bruce Roberts, are pioneers in holistic & integrative care. Between them, they’ve practiced in a wide variety of clinical settings. Both now work as integrative “specialists” at the Institute of Health & Healing, a unique new practice model established by Sutter Pacific Medical Foundation & the California Pacific Medical Center. They’ll describe the nuts & bolts of this new model that’s poised for wider implementation nationwide. Our “lawyer in the family” returns with an update on all things medicolegal & regulatory, as they apply to the practice of holistic, integrative & functional medicine. Mr. Dumoff has been practicing law since 1988, with a focus on “preventive lawyering” for integrative clinicians. In this talk, he outlines the “Top Ten” medicolegal mistakes he sees integrative & holistic practitioners making, and offers practical tips for preventing & managing them. A lifelong interest in holistic medicine, combined with a degree in Economics from the University of Nottingham, led James Maskell to found Revive NYC, a practice development consultancy dedicated to helping holistic clinicians succeed. One of the stand-outs at Heal Thy Practice 2011, Mr. Maskell returned in 2012 to join forces with Miriam Zacharias. Together, they take a tag-team approach and share insights & strategies for using the ‘net to make your practice the health hub of your community. A leader in the field of functional medicine, Dr. Hays is also at the forefront of innovative practice design. Her True North clinic in Falmouth, ME, now celebrating its 10th year, is widely recognized as a model of integrative, community-based care. Dr. Hays will describe the “Circle Process,” a unique, non-heirarchical approach that guides all decision-making at True North. She also shares her insights on making integrative care work in the real world. Office-based dispensing of nutraceuticals, botanical medicines, & other health products can provide clinicians with assurance that patients are taking high-quality, safe, effective supplements. It can also create a vital new revenue stream to support integrative practice. In this sponsored breakout session, Dr. Chasse—a successful naturopath in Bedford, NH—describes how dispensing fits into her practice, and the practice support tools offered by Emerson Ecologics, the nation’s largest distributor of practitioner-only products (Sponsored by Emerson Ecologics). Insurance-based systems have eroded the practitioner-patient relationship & reduced clinical practice to endless rounds of abrupt visits, unproductive bureaucratic hassles, and perverse incentives. There are better ways! Chris Shoffner will explore Physician Care Direct, a pragmatic and effective vision for practice transformation. The PCD approach offers a replicable direct-pay model that empowers physicians and patientsalike, and improves health outcomes without simply throwing more money into broken systems.